Only a mainsail at present as it has only ever been used for stability and motor sailing. She is capable or sailing at about 4 knots no engine single handed. Stainless steel water tanks have been grp lined. The diesel tanks have a siphon system to remove any water present in the fuel. The cabin heating system needs a new boiler which would cost approx 2000 Euros. Manuel water system for sea water to sink and also a soap dispenser. All appliances are 24 volt except microwave, and washing machine. The boat has a sea water collection tank so that all sea water comes in through one hull fitting. 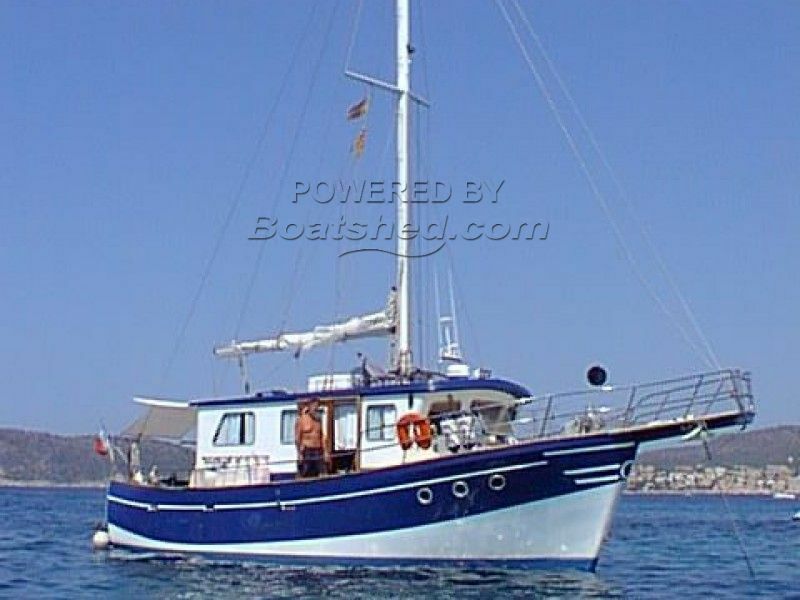 A charming, timeless, character trawler yacht, with a solid safe and sturdy feel. She is a very comfortable sea boat; ideal for long distance economical cruising and life aboard. The current owners bought the boat in 2001 and had it delivered to the Med by road and returned from 12 years cruising the Med in 2013. The boat is currently their summer home. She is a one off build and has been very carefully thought out to allow spacious cruising for 2 plus 2. A huge dining area and full kitchen really does mean that she is a true live aboard. The open aft deck is perfect for al fresco dining. She benefits from a powerful but economical main engine and a secondary engine which can be used to operate the two other props for line fishing at 1.5 knots. At the moment this engine is just used to operate all the hydraulics on the boat and the owner has fitted a hydraulic bow thruster. The boat would be able to do the canal passage through France but not the canal du midi du to the bridge height. This Motor Sailor 12m Trawler has been personally photographed and viewed by a representative of Boatshed Sud Med. Click here for contact details.